Mens Invicta Pro Diver Blue 23kt Gold Tone NH35A Automatic Coin Steel Watch New. MENS INVICTA P RO DIVER NH35A MECHANICAL COIN BEZEL WATCH. The round silver-tone 316L stainless steel case displays a unidirectional coin edged rotating bezel with gold-tone chapter markers. “INVICTA” is etched into the left side of the case and a very special exhibition case back reveals the automatic movement from within. The round blue dial displays luminous Tritnite hour markers trimmed in gold-tone at all hour positions except 3:00. Gold-tone hour and minute hands show Tritnite filling. The gold-tone seconds hand exposes a Tritnite tip and the Invicta logo. A magnified date window appears at 3:00 and “JAPAN MOVT” displays at 6:00. This function is propelled by a Japanese NH35A Automatic movement. The silver-tone 316L stainless steel bracelet features satin brushed outer links with polished gold plated inner links for a sleek look. It secures with a deployant clasp. Emphasize your style with this Pro Diver from Invicta! Movement: Japanese NH35A Automatic w/ 24 Jewels. Bracelet Measurements: 8-1/2 L x 20mm W. Water Resistance: 20 ATM – 200 meters – 660 feet. About Swiss Made timepieces Timepieces with the “Swiss Made” label enjoy a solid reputation for quality craftsmanship and aesthetic appeal. Since the 16th century, Switzerland has been the epicenter of watch making producing some of the industries greatest technological advances. Flame Fusion Invicta has boldly stepped into the fire and re-emerged with yet another technical achievement. In a process utilizing high heat, high pressure and an Aluminum Oxide combination, the mineral (glass) and Sapphire properties are fused together. This unique fusion results in the impact resistance of a standard mineral crystal and offers the scratch resistance of the Sapphire. Flame Fusion is one more way in which Invicta continues to set new, superior standards, making their timepieces the exception to any rule. Rest assured, your watch will come fully insured. International packages are full insured by ShipSurance. We are not responsible nor have any control over custom delays. Item must be in the exact condition it was sent out with all tags and protective plastics intact. Track Page Views With. Auctiva’s FREE Counter. More On Water Resistance: If your item is a chronograph, never use chronograph functions in water. Just because a watch might be stamped “100 Meters Water Resistance” does not mean you can dive to 100 meters. PLEASE READ THESE HELPFUL LINKS ABOUT WATER RESISTANCE BEFORE GETTING YOUR WATCH WET. Add a map to your own listings. The item “Mens Invicta Pro Diver Blue 23kt Gold Tone NH35A Automatic Coin Steel Watch New” is in sale since Wednesday, October 15, 2014. This item is in the category “Jewelry & Watches\Watches, Parts & Accessories\Wristwatches”. The seller is “bulldog_enterprise” and is located in USA, USA. This item can be shipped worldwide. 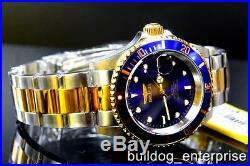 This entry was posted in mens and tagged 23kt, automatic, blue, coin, diver, gold, invicta, mens, nh35a, steel, tone, watch.